It was a day after Marie Dixon, widow of blues great Willie Dixon, died, and several legends were gathered in a downtown hotel in support of a granddaughter, Tomiko Dixon. 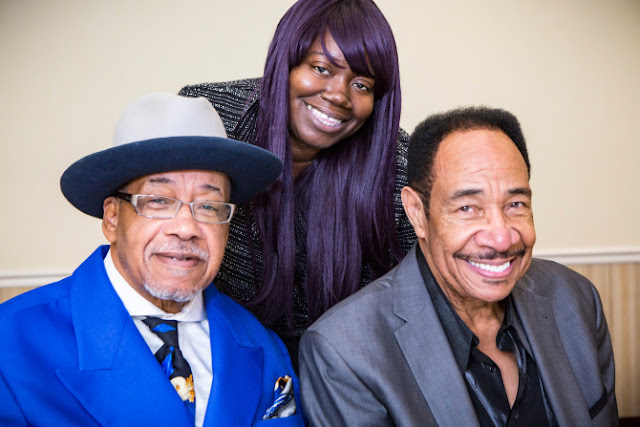 There was R&B legend Gene “Duke of Earl” Chandler, who is Tomiko Dixon’s amore, and her godfather, Marshall Thompson, founder of the legendary Chi-Lites, credited with birthing a generation of R&B vocal groups. There was her godmother, longtime artist developer Helen Wooten, who’s worked with likes of R. Kelly, Da Brat and Darnell Jones; her harmonica player, Jeff Stone, whose Zack Harmon Band was the rage in the mid-2000s after winning the International Blues Challenge, and her lawyer, Jay B. Ross, who represented her grandfather as well as Muddy Waters and likely more blues acts than any other entertainment attorney. What was this diverse group doing at a Holiday Inn on Harrison? Why, they’d been summoned by the 36-year-old Dixon granddaughter. This fiery young blues singer, who is making her mark in her grandfather’s world as a singer, writer and collaborator, having become the youngest person ever inducted into Chicago’s Blues Hall of Fame in October, seems able to accomplish any feat she sets her mind to. “My grandfather was always there for me, as a child. He always checked my report card, bought my school clothes, made sure I was keeping up with my lessons in school. Even when he and my grandmother split and he’d moved to California, he still came. He’d tell me he came here to visit me. I don’t know if that’s true,” she says, laughing. To back up, Tomiko Dixon is the child of Johnnie Dixon, seventh child born to Willie Dixon and her blood grandmother, Elnora Franklin, with whom Willie Dixon lived in a common-law marriage before meeting Marie Dixon, to whom he was married 36 years before his death in 1992. It’s complicated, Tomiko Dixon says. Both women knew of each other, and accepted it. Both women bore him children; Marie Dixon had five. Tomiko Dixon’s mother had her at age 19, so it was her grandmother, her grandfather and her step-grandmother, she says, who raised her. Elnora Franklin passed three years after Willie Dixon, in 1995. After dropping out of high school and getting kicked out of the house by her mother at age 17, Tomiko Dixon set out to find her own path. “I always loved music when I was growing up, but for some reason, my family did not. They figured, you know, that’s what Granddaddy did, and it tore up the family. And then there were drugs and different things of that nature involved, so they had bigger expectations for me,” she says. She went to college, got an Associate’s degree, floated between jobs until 2005, when a supervisor learned her heritage and asked her to sing a Willie Dixon song. Her grandfather’s legacy includes such blues standards as “Little Red Rooster,” “My Babe,” “Back Door Man,” “I Just Want to Make Love to You,” “Wang Dang Doodle,” “Hoochie Coochie Man,” “Spoonful” and “I Can’t Quit You Baby. His songs were recorded by the likes of the Rolling Stones, Bo Diddley, Chuck Berry, Eric Clapton, Elvis Presley, Led Zeppelin, Cyndi Lauper, Bob Dylan, the Doors and Fleetwood Mac. “I started singing, ‘You can’t judge a book by its cover,’ and he said, ‘Wow! You should sing.’ I’d heard it before. But it was a little later — when a good friend, hearing me sing, said the same thing — that I went into the studio,” Tomiko Dixon says. Her first album, “My Inheritance,” was released in 2010; her second, “Blues Around The World,” in 2014. The latest, “Grand Blues Music,” was released last year. Her big break, she says, came with the tribute to her grandfather and Muddy Waters that she and other performers staged at last year’s Chicago Blues Fest. Among five Dixon grandchildren who paid homage to their grandfather, she stood out. Afterward, doors opened. People came knocking. Now a voting member of the Grammy academy, she’s toured the blues/rock circuit of clubs and festivals mostly in the Midwest; runs her Grand Blues Music Heritage Foundation with the mission to preserve the legacy of the blues through education, supporting other artists and honoring champions of the blues community, and writes for, publishes and collaborates with other artists through her Grand Blues Music Publishing Co.
On this day, she is teary over the death of her step-grandmother, who led the fight to ensure the rights to her husband’s music catalogue remained in the Dixon family, and purchased the building where he used to write and record, the famed Chess Records headquarters at 2120 S. Michigan that became home of Willie Dixon’s Blues Heaven Foundation. “I was very close to her. She called me her little chocolate chip. When I was a kid, she was in my life a lot. When I told her I wanted to do music, she said, ‘Well, I want you to get a publishing company, and don’t even let me hear your music until you have it published and copyrighted,’ ” Tomiko Dixon says. Ihejirika, Maudlyne. "Tomiko Dixon Keeping Alive Grandfather Willie Dixon's Legacy." Chicago Sun-Times. Accessed November 29, 2016. http://chicago.suntimes.com/entertainment/tomiko-dixon-keeping-alive-grandfather-willie-dixons-legacy/.